Villa is an oasis of peace and relaxation situated in the peaceful village of Ano Meria. 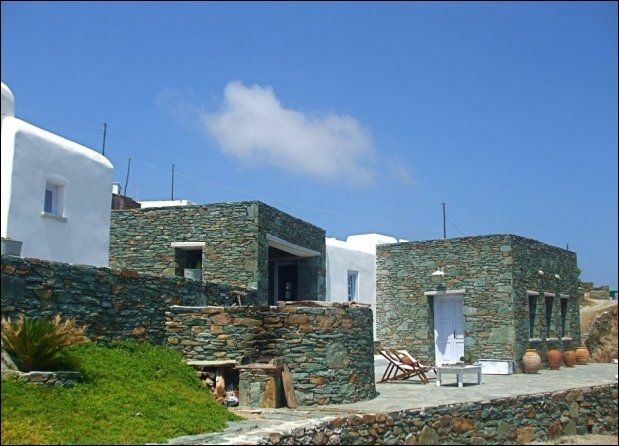 The villa is made of White washed walls and stones and is fully integrated with the surroundings. The ceilings are made of wood and the floors of polished cement .The furniture are modern and the villa successfully blends the traditional architecture with the contemporary elements. The villa consist of a main body with sitting area with fireplace, dining area with chairs, fully equipped kitchen, laundry room and master bedroom with double bed and private verandah. The heart of the house is the covered stone built verandah with fantastic views. You can spend you day there gazing at the big blue of the Aegean or enjoying epicurean meals with your company.